The Billing information is then transferred securely to PayPal for processing. Click Here for PayPal's privacy notice. We only use your email address to send you our Newsletters. We never share, sell or otherwise utilize this information. You have the right to unsubscribe at any time by clicking the Unsubscribe link at the bottom of any email or by contacting us. The data will be used for your authentication, debugging, collecting anonymous or aggregated stats, and to improve the services we provide. Consent is provided by our users explicitly when proceeding an action or task (e.g. when you provide user data, contact us using contact forms, sign up to the newsletter, sign up for training). Of course, you have right to lodge a complaint. Occasionally, at our discretion, we may include third party products or services on our website. Some are wholly-owned by Becht while others are Strategic Partners. 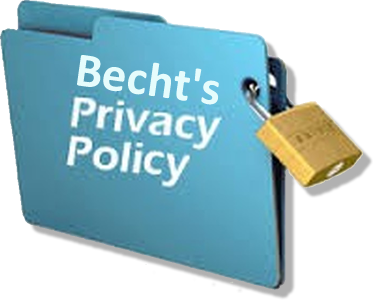 These third party sites have separate and independent privacy policies from ours. We therefore have no responsibility or liability for the content and activities of these linked sites. Nonetheless, we seek to protect the integrity of our site and welcome any feedback about these sites.